Markham recognized Scott’s potential when he first met the 18-year-old midshipman in 1887, and when Scott volunteered to lead the British National Antarctic Expedition in June 1899, Markham accepted his offer. The expedition combined the might of the Royal Navy, the Royal Geographical Society, and the Royal Society, and its aims combined exploration and science. In keeping with these goals, the expeditioners were a mix of Royal Navy and Merchant Navy personnel, as well as an array of scientists. Their vessel was Discovery—the first ship designed and built in Britain for scientific exploration. It was constructed in Dundee of oak strengthened with internal beams and clad in a steel bow. King Edward VII came to the ship at Isle of Wight to wish them well, and Discovery sailed on 6 August 1901. The king’s blessing did not prevent the slow but sturdy ship from pitching and rolling at sea, nor did it stop a persistent leak. 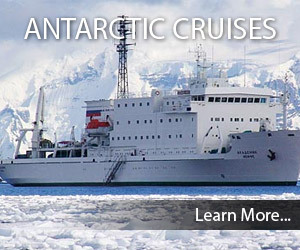 The expedition called at Macquarie Island and Auckland Island on its way to Lyttelton, New Zealand. It had an enthusiastic send-off from there when it sailed on 21 December, although one unfortunate seaman fell to his death during the celebrations. Discovery crossed the Antarctic Circle on 3 January 1902 and reached Cape Adare on 9 January. Louis Bernacchi was the only member of the expedition who had previously visited Antarctica—two years earlier as a member of Carsten Borchgrevink’s expedition. Continuing into the Ross Sea, the Discovery followed the edge of the Ross Ice Shelf eastward looking for the land reported by Ross, and eventually sighted the mountains of what is now Edward VII Land. On 4 February, at Balloon Bight (now the Bay of Whales), Scott rose in a tethered army-supplied hydrogen balloon to become the first person to fly over Antarctica, and sublieutenant Ernest Shackleton followed him to become Antarctica’s first aerial photographer. 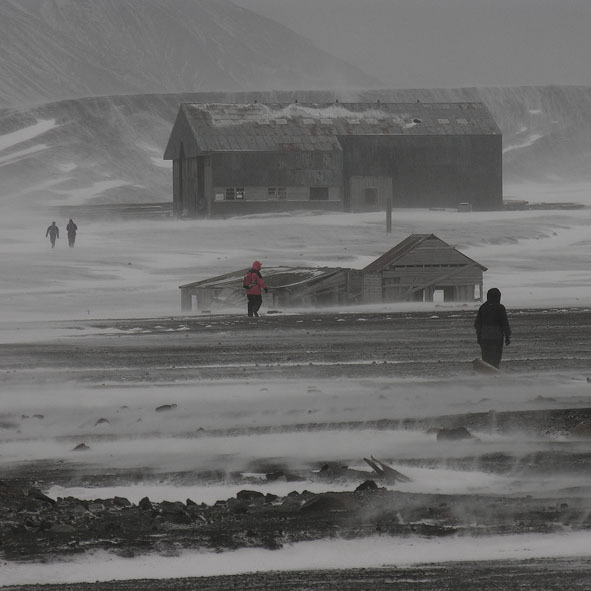 The expedition established its base at Hut Point on Ross Island and began to make some excursions. On a badly managed trip to Cape Crozier, seaman George Vince died when he slipped over a cliff, and Frank Wild displayed Antarctic ingenuity by hammering nails into the soles of his boots to provide extra traction on the ice. The Adélie penguins around the base were a source of endless fascination, and Scott noted that the Emperors headed south at the start of winter—the first recorded observation of their remarkable breeding pattern. In early October Charles Royds led a party to Cape Crozier where, on 12 October, Reginald Skelton found Emperor penguins with well-developed chicks—a clear indication that they had hatched during the bitter Antarctic winter. The first-ever attempt to sledge to the South Pole left Discovery on 2 November 1902. The three-man party comprised Scott himself, Edward Wilson, and Ernest Shackleton, with 19 dogs. Twelve men had left earlier to deposit supply caches for the polar party on their return journey. The groups soon met up and traveled together until 15 November, when the polar party pressed on alone. Scott was confident at first, but progress was slow; the dogs were underfed and overloaded, and the men mostly had to haul the sledges themselves. Scott and Shackleton began to annoy each other. Years later, the amiable Wilson recalled an event on the ice cap. After breakfast, while he and Shackleton were loading the sledges, Scott shouted: “Come here you bloody fools.” When Wilson asked if Scott was addressing him, Scott replied “No.” “Then it must have been me,” said Shackleton, and when Scott was silent, continued: “Right, you’re the worst bloody fool of the lot, and every time you dare to speak to me like that, you’ll get it back.” It was an odd exchange at the bottom of the world, where each relied on the other for survival. But they did not win. In fact, although they set a new furthest south of 82°16´ on 30 December 1902, they did not travel beyond the Ross Ice Shelf. By then all were suffering from scurvy, and the last few dogs died on the return journey. Shackleton, the largest man, suffered most from scurvy and lack of food, and even had to ride briefly on the sledge at the end of January. By 3 February 1903 they were back at Hut Point. A relief ship, Morning, reached Ross Island on 23 January under the command of William Colbeck, who had discovered what is now Scott Island on the voyage down the Ross Sea. However, Colbeck could not sail within 13 kilometers (8 miles) of Discovery because the sea ice had not fully melted over summer. It never did melt that summer, so Discovery remained set in ice for the coming winter, but at least the expedition had fresh supplies. Scott decided to send back “one or two undesirables” and, with the approval of surgeon Reginald Koettlitz (but not of Albert Armitage, his second-in-command), included Shackleton on the list, claiming that he was not fit enough to continue. The real reason may have been that Shackleton was popular and charismatic while Scott had to rely on rank to keep control. Reportedly Shackleton wept as he sailed away. There was a series of excursions over the winter of 1903 and into the following summer. Bernacchi took over the editorship of the South Polar Times. Armitage had led a sledging trip into the mountains of South Victoria Land on the other side of McMurdo Sound in November 1902, and that group became the first to stand on the polar ice cap. Scott took a party into the same area on 26 October 1903, and journeyed well beyond the point Armitage had reached. When they returned on Christmas Day, after being away for 59 days and covering 1,170 kilometers (725 miles), Scott had formed a strong bond with the two seamen he had traveled with: Edgar Evans and William Lashly. Both were to accompany him on his next voyage. Next summer the British government sent Morning and Terra Nova back to Ross Island to evacuate the party. They arrived on 5 January 1904, with instructions that all the expeditioners were to leave by the end of summer, even if it meant abandoning Discovery. Luckily, the ice broke up in February (with the help of dynamite) and the relief ships were able to reach Discovery on 14 February—two days later Discovery herself was free. The relief vessels immediately sailed north, while Scott took Discovery on a surveying voyage along the coast of Victoria Land. They were back in New Zealand by the beginning of April, and arrived off Spithead, near Portsmouth, on 10 September 1904. Scott was promoted to the rank of captain on that day. His two-volume account of the expedition, The Voyage of the Discovery, has become a classic of Antarctic literature.